Gunakan site24x7 untuk monitoring web Anda..
Nginx is a popular open source high-performance web server for larger web setups. It is known for its rich feature set, simple configuration, and low resource consumption. Applications Manager's Nginx monitoring feature helps optimize Nginx server performance and provides comprehensive management reports. Take corrective action by executing custom scripts to start Nginx in case of failures. 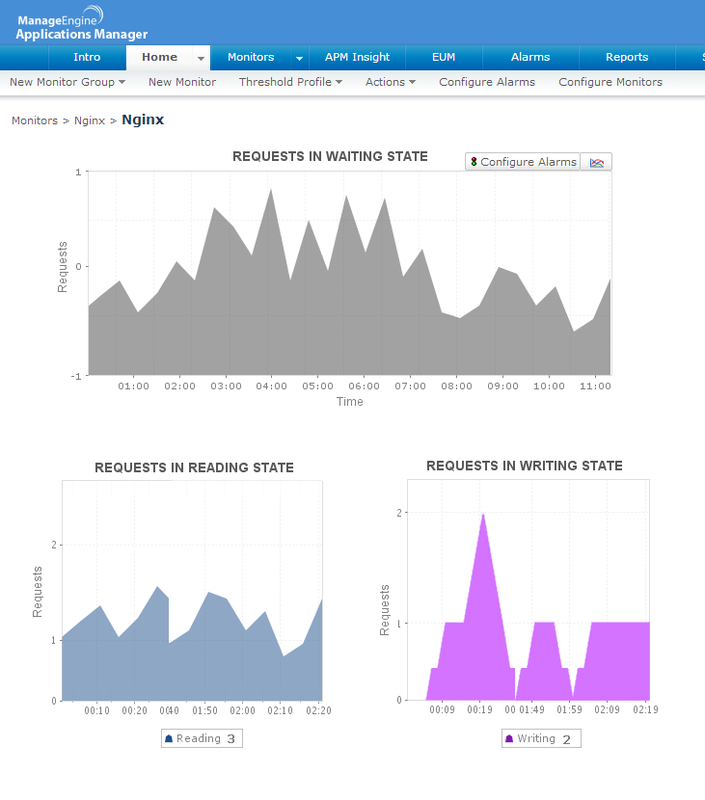 Monitor requests served by Nginx. 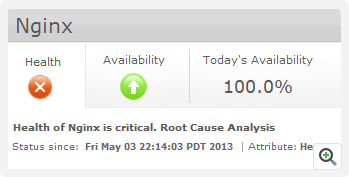 Get alerts when the performance is degraded. Monitor requests in waiting state. Reports which can be grouped based on availability, health, and connection time. 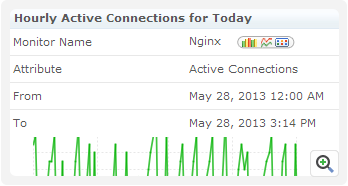 Insight into performance of your Nginx server over a period of time. TEMPO.CO, Jakarta-Akses Internet saat ini dan di masa datang memiliki peranan penting dalam menggerakkan sektor perekonomian nasional. Hampir seluruh kegiatan bisnis memanfaatkan konektivitas data sehingga dalam prosesnya dapat berjalan dengan lancar, efisien dan menguntungkan. Akses Internet juga membuka peluang kawasan di pelosok daerah untuk berkembang. Hal ini dapat memacu akselerasi pemerintah dalam mencapai Tujuan Pembangunan Milenium (Millennium Development Goals-MDGs) pada 2015 mendatang. Dalam upaya mencapai target MDGs tersebut, salah satu BUMN Indonesia, yakni PT Telekomunikasi Indonesia Tbk berhasil meraih predikat runner up dalam penghargaan pencapaian MDGs bidang Kesehatan Ibu dan Anak. Telkom meraih penghargaan tersebut setelah mengikutsertakan Aplikasi Pembelajaran Bahasa untuk Tunarungu i-CHAT (I Can Hear and Talk). Program kepedulian terhadap komunitas anak berkebutuhan khusus tersebut mendapat pengakuan dari pemerintah dan masuk ke dalam penilaian untuk anugerah Millennium Development Goals yang diprakarsai Kantor Utusan Khusus Presiden RI (KUPRI) untuk MDGs. Tentunya untuk mencapai target MDGs 2015 di bidang-bidang lainnya, serta program MP3EI perlu dukungan jaringan teknologi yang menghubungkan setiap wilayah Indonesia. Untuk itu Telkom berupaya menghadirkan program-program inovatif. Salah satunya adalah program Indonesia Digital Network (IDN) 2015. Program pembangunan jaringan infrastrukturbroadband nasional sepanjang 26 ribu km yang membentang dari Sabang hingga Merauke ini salah satu tujuannya adalah menghadirkan solusi konektivitas secara menyeluruh di Indonesia. Harapannya, dengan hadirnya solusi konektivitas ini akan tercipta peningkatan akses Internet hingga ke pelosok daerah yang selama ini belum tersentuh. Saat ini, akses Internet di Indonesia memang masih belum merata. Berdasarkan hasil survei yang dilakukan Badan Pusat Statistik (BPS) bekerja sama dengan Asosiasi Penyelenggara Jasa Internet Indonesia (APJII), angka pertumbuhan pengguna Internet di Indonesia hingga akhir 2013 sudah mencapai 71,19 juta orang. Hasil survei ini juga menyebutkan penetrasi Internet di Indonesia saat ini adalah sekitar 28 persen dari total populasi penduduk Indonesia. APJII juga memperkirakan pertumbuhan pengguna Internet di Indonesia diasumsikan akan bertambah menjadi 107 juta pada 2014 dan 139 juta atau 50 persen total populasi pada 2015. Dalam laporan ini juga mencatat kawasan Indonesia timur mencapai tingkat pertumbuhan pengguna Internet tertinggi dibanding kawasan lain di Indonesia. Untuk antar-provinsi kalangan industri, Sulawesi Utara tercatat sebagai provinsi yang sudah 100 persen atau peringkat tertinggi yang menggunakan komputer dan Internet dalam aktivitas bisnis. BPS juga mencatat provinsi pengguna komputer dan Internet terendah adalah Maluku Utara sebesar 40 persen. Mahakarya Indonesia “IDN 2015” merupakan sebuah terobosan konektivitas untuk membangun kehidupan yang lebih baik dan meningkatkan produktivitas nasional. IDN 2015 terdiri dari ID Access (High Speed Broadband Access through Optical Fiber Network & Wi-Fi), ID Ring (IP-based and Optical Backbone Network) dan ID Convergence (Integrated Next Generation Network for Multi Services & Multi Screen). Melalui ID Access, Telkom berkomitmen mendukung MP3EI melalui penyediaan 20 juta true broadband access ke rumah-rumah serta satu juta akses Wi-Fi yang dapat melayani 10 juta pelanggan. Adapun inisiatif ID Ring dapat dilihat dari kontribusi Telkom pada proyek Palapa Ring dari Pemerintah RI untuk menghubungkan seluruh jaringan backbone berbasis serat optik. Telkom berkomitmen menggelar 30 node terra router dan sekitar 75 ribu km kabel serat optik. Sedangkan ID Con adalah pengembangan infrastruktur jaringan service node menujuintegrate NGN (Next Generation Network) untuk multi-screen dan multi-service yang akan menghadirkan berbagai produk serta layanan. MELBOURNE, Australia and PLEASANTON, Calif. - March 18, 2014 - ManageEngine, the real-time IT management company, today announced the launch of its new converged infrastructure (CI) management software, CI Manager Plus. Available immediately, CI Manager Plus simplifies the Cisco Unified Computing System (UCS) monitoring tasks of data center administrators at large enterprises. ManageEngine will be demonstrating the new application's features at Cisco Live, March 18-21, 2014, in Melbourne, Australia. At the show, ManageEngine will be in booth 27. In a Cisco UCS environment, the real challenge is managing it. UCS Manager offers comprehensive UCS management, but it is not very user-friendly and has a very steep learning curve. It floods the admins with a lot of uncorrelated events. With CI Manager Plus, UCS management is easy and simple and eliminates the complexities involved with UCS Manager. CI Manager Plus monitors Cisco UCS via UCS Manager XML APIs. It discovers the UCS and monitors all the devices in the system periodically. CI Manager Plus provides a 2D map of the UCS architecture to help visualize the parent-child relationship of all the devices in the system. This allows data center admins to drill down and identify the exact device that is causing the problem. CI Manager Plus also provides a 3D UCS builder that helps admins create exact replicas of their UCS infrastructures in 3D and embed them in the CI Manager Plus dashboard. CI Manager Plus provides only the essential performance and fault data, thereby helping admins reduce the effort required to sift through the mountain of data generated by UCS Manager. CI Manager Plus also includes the best-in-class fault management module, which correlates all the related events raised by UCS Manager into meaningful alarms and uses color codes for differentiating the severity of the alarm. It also includes an email notification option to alert the admins immediately. "Most large enterprises today want their data centers to be agile and energy efficient," said Bharani Kumar, marketing manager for CI Manager Plus at ManageEngine. "Converged infrastructure devices such as UCS let them quickly expand their data centers and, at the same time, go green. This trend will continue to grow, and a lot of large enterprises will adopt such converged infrastructure devices." CI Manager Plus is built on OpManager, ManageEngine’s highly scalable, data center infrastructure management software that supports monitoring of 50,000 devices or 1 million interfaces from a single server. Data center admins seeking more visibility into their data center can convert CI Manager Plus into OpManager for network management, physical and virtual server monitoring, 3D data center visualization, workflow automation and more. CI Manager Plus is available for immediate download at http://www.manageengine.com/converged-infrastructure/download.html. Pricing starts at $995 USD for monitoring a single UCS. B-Series, C-Series and virtual server monitoring is priced at $1,995 USD for 50 devices. 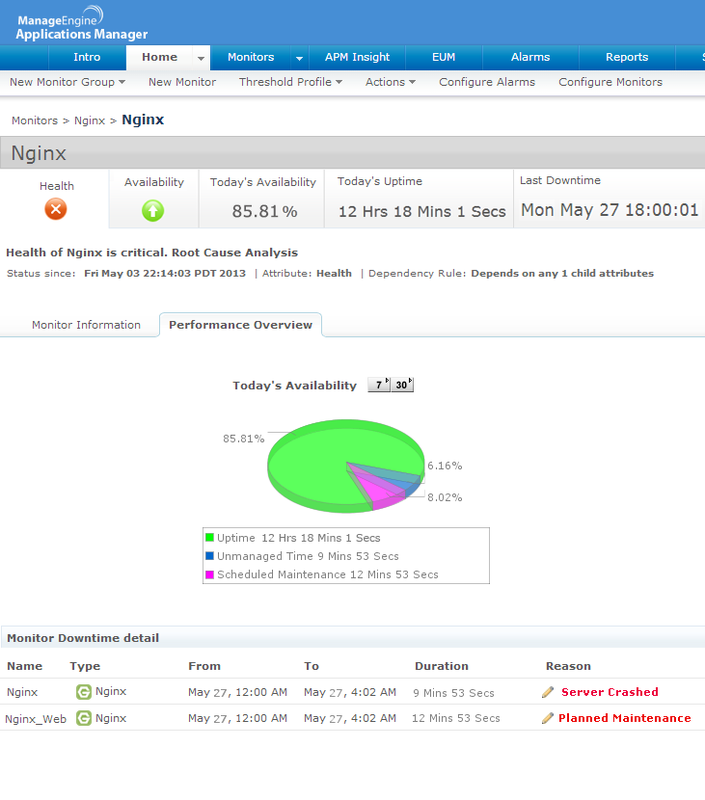 For more information on CI Manager Plus, please visit http://www.manageengine.com/converged-infrastructure/index.html. For more information on ManageEngine, please visit http://buzz.manageengine.com/; follow the company blog at http://blogs.manageengine.com/, on Facebook athttp://www.facebook.com/ManageEngine and on Twitter at @ManageEngine. CI Manager Plus is a Cisco UCS monitoring solution with 2D maps and advanced fault management modules. The 2D map of CI Manager Plus provides the complete hierarchy of a UCS with all the parent-child relationship mapped among its devices. Its advanced fault management module provides color-coded alarms for faults raised and instantly sends an alarm notification via email. For more information on CI Manager Plus, please visithttp://www.manageengine.com/converged-infrastructure/index.html. ManageEngine OpManager is a network management platform that helps large enterprises, service providers and SMEs manage their data centers and IT infrastructure efficiently and cost effectively. Automated workflows, intelligent alerting engines, configurable discovery rules, and extendable templates enable IT teams to setup a 24x7 monitoring system within hours of installation. Do-it-yourself plug-ins extend the scope of management to include network change and configuration management and IP address management as well as monitoring of networks, applications, databases, virtualization and NetFlow-based bandwidth. For more information on ManageEngine OpManager, please visit http://www.manageengine.com/opmanager. ManageEngine delivers the real-time IT management tools that empower an IT team to meet an organization's need for real-time services and support. Worldwide, more than 90,000 established and emerging enterprise customers - including more than 60 percent of the Fortune 500 - rely on ManageEngine products to ensure the optimal performance of their critical IT infrastructure, including networks, servers, applications, desktops and more. Another 300,000-plus admins optimize their IT using the free editions of ManageEngine products. ManageEngine is a division of Zoho Corp. with offices worldwide, including the United States, India, Japan and China. For more information, please visit http://buzz.manageengine.com/; follow the company blog athttp://blogs.manageengine.com/, on Facebook at http://www.facebook.com/ManageEngine and on Twitter at@ManageEngine. An old management axiom says, "You can't manage what you don't measure." Learn how one company leverages Active RFID to help data centers run more efficiently. A small data center may have 500 racks, with each rack conservatively holding 30 IT devices. That's 15,000 pieces of electronic gear in inventory. As someone who has a hard time remembering what's in his backpack, I cannot begin to fathom how one tracks 15,000 things, or even dare to contemplate how those responsible for inventorying assets in monster data centers manage to know the location of all their stuff. To get some insight into how data-center managers pull off what seems to be a miracle, I asked Richard Jenkins, Vice President of Marketing & Strategic Partnerships at RF Code, Inc., for his help. My first question for Jenkins was: How does a data center keep track of all that equipment? "Most data centers still take inventory manually," Jenkins said. "People either read the labels, scan bar codes, or use passive RFID technology; then somehow enter the information into the data center's inventory software." Figure A highlights the pluses and minuses of each asset-tracking method. From Figure A, one can see that Active RFID seems like the opportune technology to use for asset tracking. Using Active RFID means asset tags have a transmitter and a power source, which are used at predetermined times to transmit pertinent information to a management system. Active RFID was an ulterior motive for my contacting Jenkins; RF Code is one of only a handful of companies using Active RFID to provide an automated system for tracking data-center assets. "RF Code is not a Data Center Infrastructure Management (DCIM) vendor per se; rather its primary focus is to offer products that make the DCIM implementation better through delivery of real-time asset and environmental data." "Although the company offers stand-alone asset management and environmental monitoring solutions that are fully functional and can meet the needs of many organizations, RF Code's real strength is in its data-collection capabilities via easy to deploy, low/no maintenance wire-free sensors, tags, readers, and open architecture which allows integration with any DCIM solution." Gartner went on to explain that RF Code's solution had two types of sensors and a way of integrating it all into a workable system (Figure B). Asset Management Solution: The asset sensor tags and the rack locators in Figure B work together to precisely locate the asset. The sensor tags are only granular enough to locate the device to a zone within a room. The rack locators will locate the server or networking implement to the exact rack and rack slot. Both sensors periodically transmit location information to the readers, which relay the data to the zone and asset manager, allowing data center personnel to monitor the assets and perform inventory functions. Environmental Monitoring Solution: Active RFID sensors monitor temperature, humidity, differential air pressure, fluid detection, and power distribution unit (PDU) power usage at each individual rack and designated raised-floor space. Figure C shows a heat diagram from a RF Code installation. Integration: Data center managers want to improve efficiency, avoid downtime, and plan for growth. In order to achieve all of these goals, they need a real-time overview of the power and cooling performance of its facility, asset location, and workload distribution. This is where Gartner feels RF Code has the advantage with a fully-integrated system. The fact that RF Code software provides an open architecture allows developers to integrate RF Code systems into larger DCIM environments. As soon as shipping receives an asset and attaches an Active RFID asset tag, it can be tracked. This is an important consideration in larger data centers where devices are easily lost or misplaced. The Network Operating Center is immediately notified when a piece of equipment is moved without authorization. An attempt to remove the asset tag will raise an alarm—this is only possible using Active RFID. Jenkins mentioned something interesting. He said a customer told him that RF Code's asset tracking and environmental monitoring system enables their data-center personnel to "defragment the data center" in real-time. "For us to run the most dynamic IT service possible for our customers, we must position and provision resources before they are needed—similar in a fashion to what happens when a hard drive is defragmented." Trying to fathom defragging a data center is a bit like my working through data center personnel inventorying 15,000 servers. Something that is not hard to understand is the advantage of an automated Active RFID asset management system. My thanks to Richard Jenkins for explaining the intricacies of managing data center assets. Site24x7 website monitoring lets you track the availability and response time of your websites from 50+ monitoring locations across the globe. Keeping a close watch on how your website behaves for your customers, lets you attend performance issues faster before it impacts your end user. Monitor the up-time and performance of your business critical e-commerce or banking applications from 50+ monitoring locations across the globe. Site24x7 lets you record each step in your e-cart or play back these synthetic transactions at regular intervals to find out if there is any sluggishness in application performance that will drive away your impatient customer. Monitor availability of critical services. We support monitoring HTTP(S), FTP(S), DNS, PING, TCP, SSL, SMTP, POP, etc. Monitor your Java, .NET and Ruby on Rails web transactions and drill down to offending code and pinpoint root cause of issues from the cloud. Get comprehensive performance metrics of Amazon EC2 and RDS instances and ensure peak performance of business-critical applications and services hosted on your Amazon platforms. Gain insight into the resource utilization of EC2 and RDS instances and the applications running on them. Gain a holistic view of your VMware infrastructure. Monitor VMware vSphere hosts andvirtual machines (VMs). Get graphical views, alarms and thresholds, out-of-the-box reports, comprehensive fault management and maximum ESX server uptime. Monitor critical server metrics such as CPU, Disk, Memory, Process, Services and Network Utilization of Windows servers that run critical applications. Ensure minimum overhead and maintenance costs. Monitor performance of Mailbox, Hub Transport, Client Access, Unified Messaging and Edge roles in your Exchange deployment. Site24x7 can ensure DNS look-ups are working and your DNS server is resolving domain names correctly. 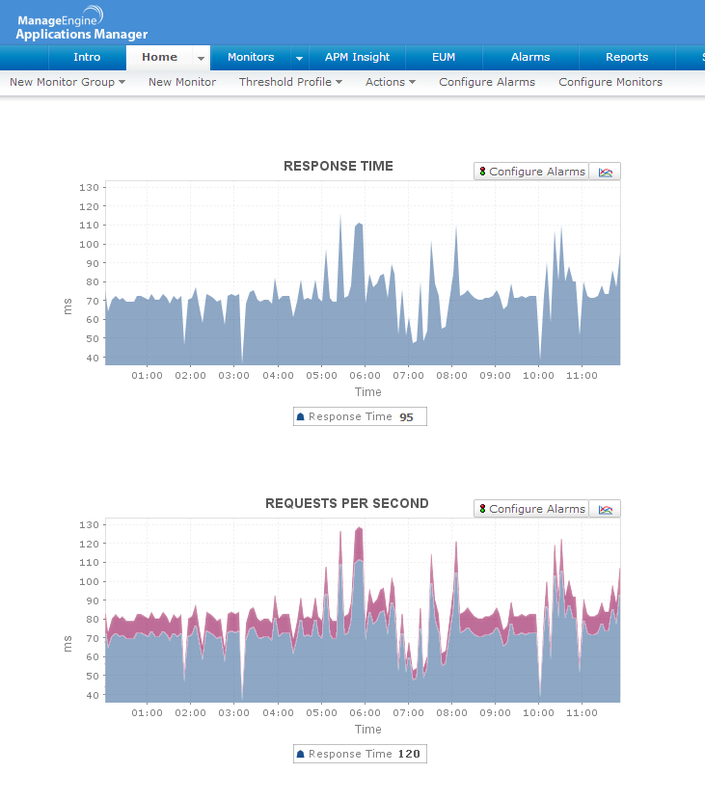 You can also monitor the response time for DNS resolutions and DNS look-ups. Set alerts to notify you before the SSL certificate of your website expires. Ensure you have a valid SSL certificate to maintain customer confidence on you online presence. Check the response time for uploading and downloading important files via your FTP server. Ensure optimum performance by checking the round trip time of your FTP service. Mail server monitoring from Site24x7 does a complete mail server round trip time check and ensure optimum performance. It does things just like your email client (Outlook or Thunderbird) and can monitor the response time and performance of your mail servers, both outgoing SMTP and incoming POP/IMAP. Monitor intranet portals, ERP systems, payroll applications, ping network devices, application servers, database servers and ensure other custom applications are up and performing optimally. On-Premise Poller helps you monitor internal resources and pushes performance and uptime information to Site24x7 using a cloud friendly architecture (one way HTTPS). Be notified about performance or downtime issues anywhere, anytime with alert mechanisms that support SMS, Email, Push Notifications, Twitter and RSS Feeds. Root Cause Analysis is a comprehensive report based on trace route, ping output, DNS reports and web page screenshots that gives you a conclusion on what caused the issue. With RCA you get down to fix the issue right away. Define service level agreements and track their adherence. 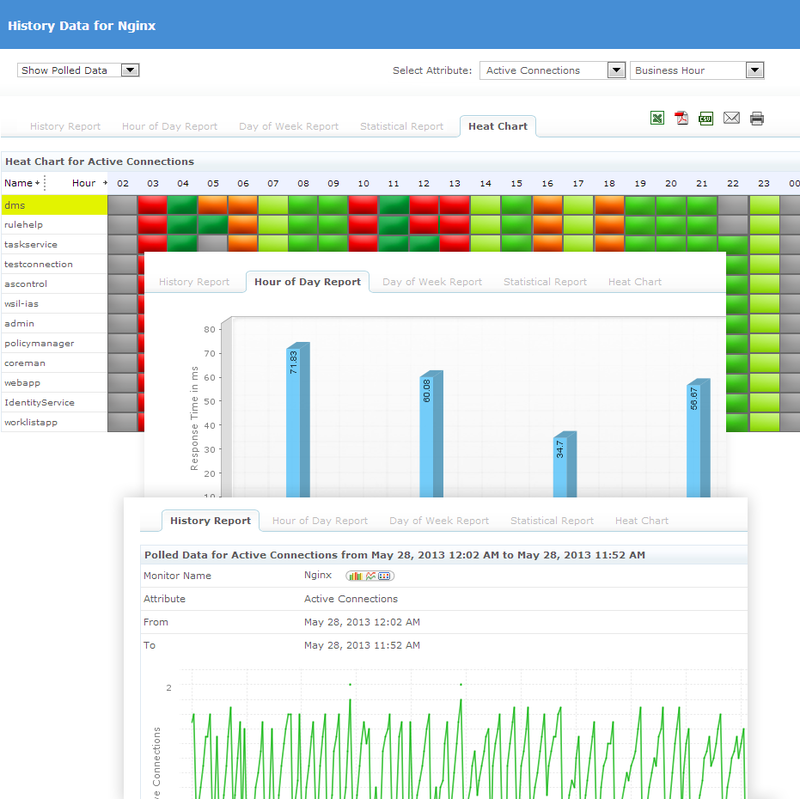 View the status of all your monitors in a single place like a LCD screen in a NOC. You can also embed this view in your webpage. The advantage of Status View or Dashboard is that it auto-refreshes and you can view the status of your monitors anytime without having to login to you account each time. In-depth and exhaustive reports that lets you analyze the performance of your monitors and identify trends over a period of time. Schedule Reports option to receive reports at your chosen time and day. 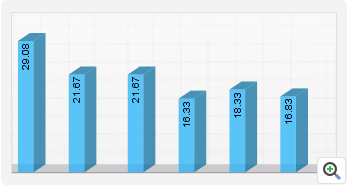 Export Reports option to export different reports as CSV, PDF, Excel or Email formats to be used for internal purposes. Apps for Android and iPhone and a dedicated mobile web that lets you track the status of your monitors anywhere, anytime. REST style APIs allows you to pull Site24x7 data in XML or JSON formats and integrate with your existing business applications. Provide role based access to view reports , status pages and monitor details to your employees, manager or your hosting provider himself.